Product prices and availability are accurate as of 2019-04-13 15:26:59 EDT and are subject to change. Any price and availability information displayed on http://www.amazon.com/ at the time of purchase will apply to the purchase of this product. Add a decorative and functional touch to any bedside table, accent table, or desk top with this sleek modern brushed steel table lamp. The Modern Style Table 3-Way Switch Lamp / Light with White Fabric Shade features a brushed steel base with a gently curved silhouette and a clean white cylinder fabric shade that gives it a cool, contemporary look. Versatile enough for use in a relaxing bedroom decorated in the style of old Hollywood glamour or a more industrial space with minimalist décor, this table lamp adds instant style to any accent table and provides ample lighting in any room. Designed for use with a 3-way type A 40 watt max bulb, this table lamp features a 3 -way switch high, medium, low, off settings that makes it easy to adjust the mood on your decor, and a simple cylinder shade that provides both up and down lighting. The metallic-tone finish and the teardrop-inspired shape give this table lamp a clean and modern look that you can use as an accent piece or pair together to create a great bedside table design. Place it in a contemporary bedroom that needs a stylish touch and a source of extra lighting, position it on an accent table in a living room or dining room decorated with clean lines and minimalist décor. The design is sleek, sophisticated, and versatile enough for use in just about any part of your home. Overall: L:6 in. x W:6 in. x H:18 in. 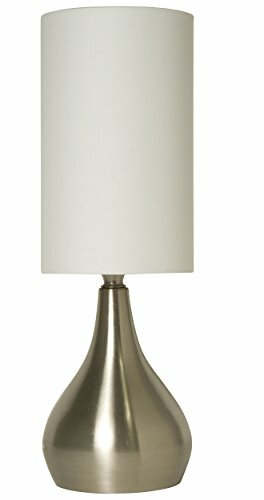 Lamp base: L:6 in. x W:6 in. x H:11 in. Lamp shade: L:6 in. x W:6 in. x H:10 in. 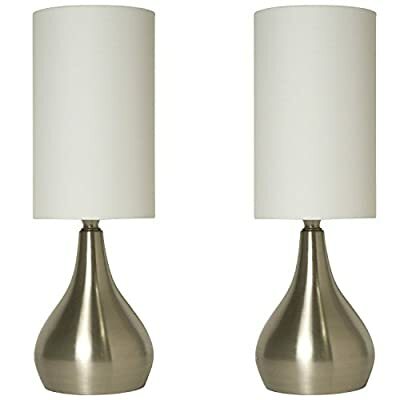 Modern style touch lamp features a brushed steel base with a gently curved silhouette and a clean white cylinder fabric shade that gives it a cool, contemporary look. Two white fabric round shades On/off touch sensor with 4 settings (high, medium, low, off) Uses 1 x 60 Watt type A incandescent bulb (not included) Measures: L:6 in. x W:6 in. x H:18 in.